Birthday Special: Katrina Kaif Celebrated Her PRE-BIRTHDAY BASH With Ranbir Kapoor & ‘Jagga Jasoos’ Crew! Ranbir Kapoor & Saurabh Shukla’s Fun Masti In ‘Jagga Jasoos’ Tukka Laga Promo! Watch The New Emotional Song “Phir Wahi” From Ranbir And Katrina Starrer “Jagga Jasoos”! 10 Bollywood Stars With Their Crazy Phobias! Watch The Adventure Of Ranbir Kapoor And Katrina Kaif In “Jagga Jasoos” NEW TRAILER! 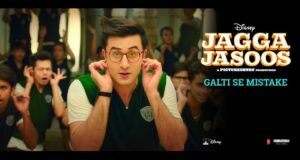 Watch New Song “Galti Se Mistake” From ‘Jagga Jasoos’ Showing Ranbir Kapoor’s Utter Cuteness! Katrina Kaif Shared A Behind The Scenes Video From The Sets Of ‘Jagga Jasoos’!